Members of The International Food, Wine, and Travel Writers Association (IFWTWA) recently had the privilege of touring the Sherman Library & Gardens in Corona del Mar, California, which included a delightful lunch of French cuisine with an emphasis on California fresh produce at the onsite restaurant, Chez Jardin. 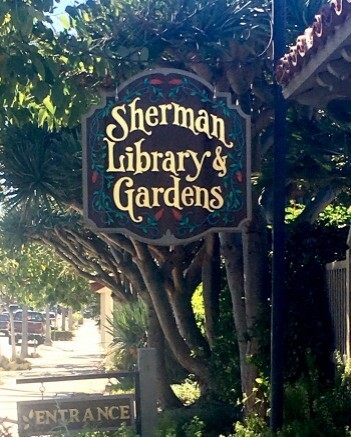 I found the backstory on how the library and gardens began to be both interesting and heartwarming. The seminal journey of the current property began in 1955 when Arnold D. Haskell purchased Norman’s Nursery on the corner of Coast Highway and Dahlia Avenue, and continued for 10 years as he acquired adjacent parcels of property. The library and gardens are named to honor Haskell’s mentor, Moses H. Sherman. Haskell was working as a clerk at the Mission Inn in Riverside, California, when Sherman tapped him to be his personal secretary. Through the years a close business and personal relationship developed with Haskell becoming president of the M. H. Sherman Company upon his mentor’s death in 1932. Sherman invested in railways and electric streetcars, making friends along the way with titans of newspaper and insurance industries, and in 1909 they joined him in establishing a home building partnership for the San Fernando Valley. This enterprise created subdivision housing in what is now Canoga Park, Encino, and Van Nuys. A few years later, in 1914, the group purchased the Tejon Ranch – an area familiar to all who have traversed the Grapevine Pass through the Tehachapi Mountains into the San Joaquin Valley. Sherman and his investment group developed Hollywoodland, a subdivision in the Hollywood Hills. The iconic Hollywood sign is from this era – originally the sign said “Hollywoodland” to advertise the development. After Sherman’s death, Haskell donated the sign, along with a few hundred acres, to Griffith Park and the Hollywood Chamber of Commerce removed the “land” letters. As director of the Sherman Foundation, Haskell created a research library and botanical garden. The library would be an historical source for the preservation of Pacific Southwest documents. The gardens would be a living museum of plants, fountains, and walkways – an urban oasis for the public to enjoy. Our informative docent guided us through the gardens, which encompass just over two acres. We saw a horticulture wonder with plant-scapes representing geographical areas from all over the world, with vegetation from climates of the desert, the tropics, and the Mediterranean. 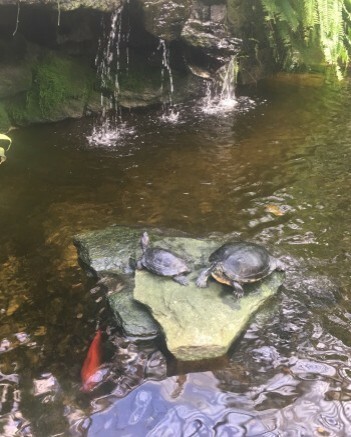 We began our tour by entering the Tropical Conservatory, a sheltered area that included a beautiful koi pond and carnivorous plants. It was interesting to note that these predatory plants evolved from a nutrient-deprived environment and developed various methods to catch insects; some plants have snap traps or sucking traps, and some plants have a sticky substance on them that snares their prey. 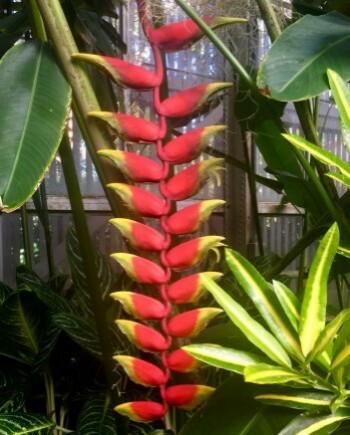 The Tropical Conservatory also includes an array of beautiful fragrant orchids, a variety of flowering ginger plants, and clusters of striking red heliconia, nicknamed lobster claws because of their appearance. The Sensory Garden contains plants selected to stimulate your senses of touch and smell. Not only can you touch the plants and herbs here, you are encouraged to do so. The mimosa pudica was my favorite plant because after you touched the sides of the small fern-like leaves, they would fold together and then rebound to their original shape within a few seconds. As we continued our tour, we enjoyed the fragrant Rose Garden and the lush verdant Fern Grotto. The Specimen Shade Garden contained colorful fuchsias, begonias, impatiens, and coleus. The landscaping of the Cactus and Succulent Garden is truly a work of art, largely due to the internship of a horticulture student sponsored by the Arnold D. Haskell Memorial Scholarship Program. Two summer internships are offered each year to California Polytechnic State University at San Luis Obispo horticulture students. In the middle of this garden is a large pepper tree, planted almost 80 years ago. Displayed throughout the gardens are sculptures, fountains, and seasonal flowers. 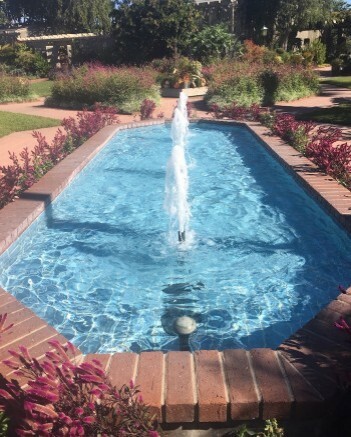 The Central Garden fountain and pool showcases a recurrent plant display, based on the season. Adjacent to the fountain, in this enchanting floral setting, is the aptly named restaurant, Café Jardin. 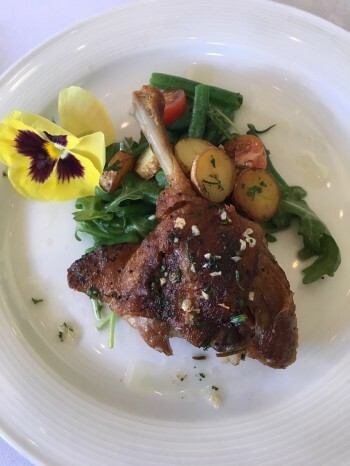 In French, “jardin” translates to “garden” and it is in this tranquil environment that award-winning Orange County Chef Pascal Olhats has created a harmonious synthesis of French cuisine with fresh California provisions. We completed our garden tour with a lovely lunch, hosted by Chef Pascal. He is amazingly warm and personable. He talked to us about his background and culinary philosophy. Chef Pascal has impressive credentials. Born in Normandy, France, he worked with the legendary chef Paul Bocuse in Lyon. 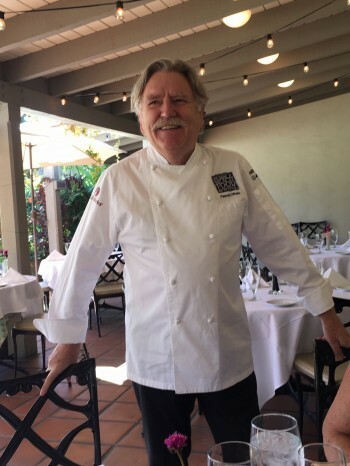 Since arriving in America over thirty yeas ago, he has brought his innovative approach to food to his restaurants (Pascal’s was awarded the Wine Spectator Award of Excellence), and Chef Pascal has gone on to inspire other great chefs in the Southern California area. 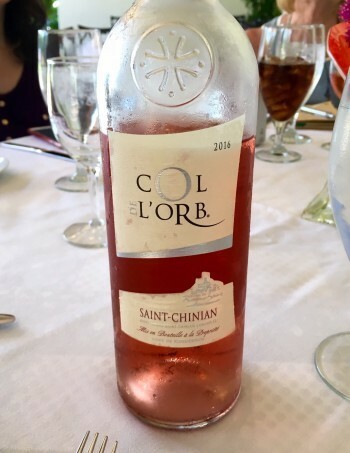 We began our tasting experience with a medium dry rosé, Cave de Roquebrun Col de l’Orb Rosé, Saint-Chinian 2016. Made from 65% Syrah grapes and 35% Grenache grapes, the rosé had a floral bouquet, and a refreshingly fruity flavor with a hint of spice. Chef Pascal paired it with a fresh beet and goat cheese salad served with a balsamic reduction, homemade country pâté with pickled vegetables, and a delightfully earthy mushroom soup. For the wine to pair with our main course, Chef Pascal selected Domaine Chevrot Pinot Noir, Bourgogne Hautes-Côtes Beaune 2016. This burgundy wine, made from 100% pinot noir grapes, has dark fruit and umami flavors which paired perfectly with the herbal game entrée of leg of duck confit accompanied by roasted potatoes, and bounty from the sea to conclude our main course, striped bass and grilled octopus, served with a saffron aioli. 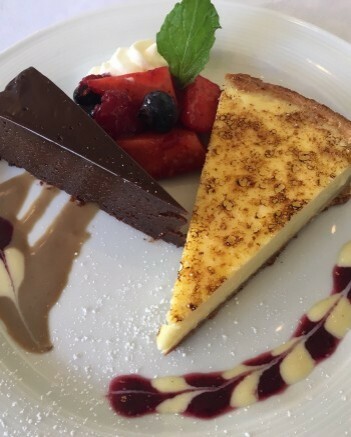 Our sweet course finale was a luscious lemon tart with berry sauce and a decadent flourless chocolate cake with an espresso sauce. Lunch is served Monday through Friday from 11:00 am to 2:00 pm. Brunch is served Sundays (seasonally) from 10:30 am to 2:00 pm. Afternoon Tea is served the second and last Wednesday of the month. Call 949-673-0033 to make reservations.